Two gold coins have been donated to the Salvation Army Red Kettle Drive this year. NAPERVILLE, Ill. (WLS) -- At least two gold coins have been donated in the Chicago area to this year's Salvation Army Red Kettle Drive. A coin valued at more than $1,200 was dropped into a kettle Tuesday night in Naperville. The donor is unknown. 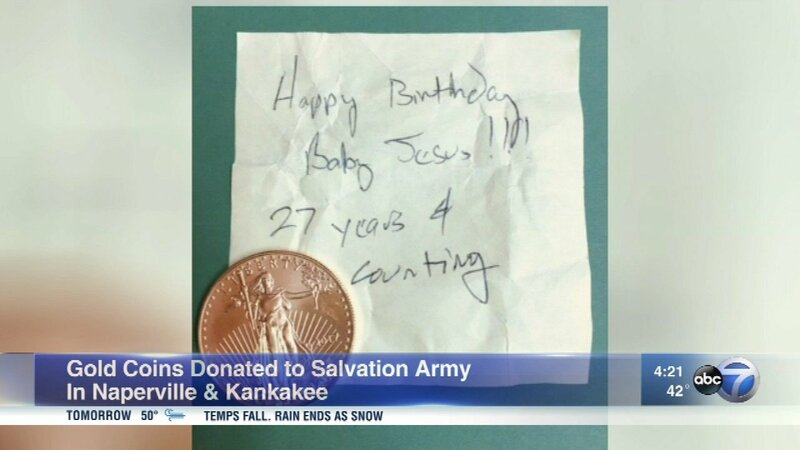 Another coin was donated in Kankakee with a note that read, "Happy birthday baby Jesus. 27 years and counting." ABC7 Chicago is told the note refers to the one person whohas been doing this for 27 years.